Spiritual practice, meditation, witness, insight, awareness. Who are the voices in integral spirituality in Australasia? My inquiry began with a question from my friend Marty from Auckland. He seems to have been very inspired by the recent emergence of Center for World Spirituality (CWS). It seems to have emerged from the dense socio-cultural networks around Integral Life, the Integral Spiritual Experience (ISE) and most especially iEvolve. An unsurprising core faculty: the same folks in iEvolve, in ISE who used to be the core team on Integral Institute’s seminar offerings: Marc Gafni, Diane Hamilton, Sally Kempton, Terry Patten. However one aspect is a little surprising. Many prior “world” or “global” integral initiatives seem to me to use those qualifiers to describe a target market; most seem to have struggled to extend their leadership beyond a narrow corridor between Boulder, CO and San Francisco, CA – sometimes extending as far afield as New York. CWS by contrast has several European teachers involved in the leadership group, which to me is a welcome expansion. Of course, my attention is always taken by who’s left out – and I’ll own that as an attentional bias – in this case: Africa, The Middle East, Asia and Australasia. In discussion, Marty has patiently explained to me (from his experience handling internationalisation at Microsoft) that the rest of the world doesn’t get left out by overstretched organisations like Integral Institute, Integral Life and CWS out of malice or neglect. It’s a kind of operational ethnocentrism – it’s just too hard to keep reaching out to a world you can’t really properly see, meet or evaluate. I (probably much less patiently) explained to Marty that I’d be more relaxed about that if I saw more apparent effort to try. We agreed that it seemed worth inquiring into whether CWS was interested in having leaders from Australasia involved and developing a list of potential names from this region to propose for them to connect with. Maybe some of us could help out with making those connections. I think it seems to both of us that things are more likely to emerge if we start from possibility rather than operating from wounds. Who are the integrally-oriented or integrally-informed spiritual leaders or teachers, either in one of the traditions (eg Judaism, Islam, Buddhism, Christianity, etc) or outside? Who have you sat with or read about or encountered or heard of in our region who you’d say is an integral spiritual leader? Integral spirituality events in the US always feature a lot of interesting people from the USA and Canada, does that mean there’s no-one in the Antipodes doing this work? 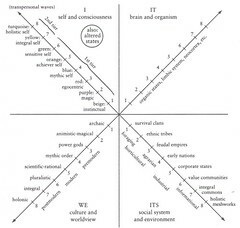 I got a bunch of terrific responses (if you’re my friend Facebook, check out the discussion on my wall) – some of them pointing out specific people, many of them interrogating the implicit leader-follower dynamic of the question and suggesting that spiritual learning may be most effectively found outside the realm of self-identified “teachers”. Peter Hayward made the interesting comment, “I suspect we have a number of spiritually informed teachers who concentrate on a certain praxis domain that is informed by spirit and a deficit of teachers for whom the praxis domain is spirituality itself”. We certainly have a few of the former, among the more visible: Peter himself and Joe Voros teaching the Strategic Foresight program at Swinburne, Tim Winton’s sustainability work at the Permaforest Trust in Byron Bay and Will Varey’s development of the learning community around his concept of apithology. Ron Cacciope’s Integral Leadership Institute in Perth has a significant profile in business circles. The emerging Integral Spiritual Network being developed by Tamara Androsoff, Tom Dünser [EDIT: and Andrew Rockell! Sorry Andrew!] out of Auckland Integral is in an early stage but already seems influential. There’s the freshly minted Keep Evolving group here in Sydney. There are local community leaders in Auckland (Tamara, Marty, Andrew and Tom), Brisbane (Ralf Mühlberger and Terry Bishop), Melbourne (Brendan Cartmel), Perth (Will Vary) and Sydney (Trish Nowland who skilfully elicits leadership from a merry band of supporters) – each of whom exemplifies a complex dance of leadership in community. There are dozens of therapists, coaches and consultants who ground their practice in spirituality and operate out of an integral orientation. Take a look at the regional directory for some specific names. The other issue that came up a few times is how “leadership” might appear differently in our local culture. Wendelin Küpers contributed his recent Integral Leadership Review paper, “Up-lifting the Integral Down Under” which (amongst other things) reflects on the culture of Australia and New Zealand in particular notions of prominence and leadership. I found it interesting to reflect on the tricky task of integral community leadership in this culture while reading Wendelin’s paper. So, given all that, based on what people have said to me on Facebook and privately and on a few of my own views, here is a non-authoritative, non-exhaustive list of folks in this region who might be considered integral spiritual leaders. “Leaders” in the sense that they have guided a substantial number of others. “Integral” either in the sense that either they explicitly use an integral model (like Wilber’s AQAL) or that they seem to teach from an integral perspective. I’ve added quotes or some explanation where I can for context. They’re listed in no particular order. Ajahn Brahm in Perth – http://www.ajahnbrahm.org/Much-loved voice in Theravada Buddhism. Very influential beyond his community, phrasing the dharma in way that is accessible to the lay public. Bhante Sujarto in Sydney – http://metta.org.au/individuals/152/bhante-sujatoThai Forest Tradition monk who has taken a lead role in advocating for the revival of women’s ordination in his tradition. Subhana Barzaghi in Sydney – http://www.subhana.com.au/about/Zen and Insight Meditation teacher and psychotherapist. A major leader in the Sydney Zen community whose influence weaves through the community of local integral folk. Philip Oude-Vrielink in Melbourne– http://www.integralalchemy.com/Business consultant and Big Mind facilitator who constantly offers affordable Big Mind, Big Heart days throughout the region, where possible in collaboration with local integral groups. Dr Jean Byrne and Rob Schütze in Sydney Perth– http://www.yogaspace.com.au/Integrally-informed Ashtanga yoga teachers with a range of other expertise and interests. “Sailor” Bob Adamson in Melbourne – http://www.sailorbobadamson.com/Widely respected Advaita teacher. If you disagree with including someone for some reason or there’s someone you think belongs on the list who isn’t there, email me or weigh in on the comments. Thanks to everyone who has contributed so far. Long time readers may sigh knowingly, but I’ve started a another blog at which I’m intending to lay out some of my theological thinking and general spiritual stuff, both theory and praxis. I’ve called it That Our Hearts May Burn With Fire. I’d be honoured if you’d join me. This blog here will continue for software, integral theory, organisational rants and miscellaneous stuff. Last night I had the great pleasure of presenting some ideas to The Sydney Psychology and Social Sciences Meetup as a talk entitled “Religion Without Belief“. It was my first attempt to talk to a general audience about some of the ideas from integral spirituality, which meant that I had to find a way to discuss the post-metaphysical stance without too much background. I’m not certain I succeeded and it certainly took me quite a while to get to anything resembling a point. Fortunately, the group was very welcoming and gentle with me. Several people who felt their needs weren’t being met very kindly asserted their needs without being critical, and I was able to adjust my course a little. I had an absolutely lovely time and some delightful conversation before, during and after. Some folks made a recording of the talk, which I gather will appear on the web in due course, so I’ll update this entry with a link to that. In the meantime, I’m posting my Prezi, a gallery of the images I used and a brief bibliography for anyone who’d like to read further. Images from "Religion Without Belief"
A lot of the ideas in the talk come from this book. If the idea of post-metaphysical spirituality appeals to you. Go look here. Macarius the Egyptian, Spiritual Homilies – the vision of Ezekiel I read out came from the opening of this. Macarius goes on to discuss the symbolism of the vision. Wallace, B. A. “The Attention Revolution”, Wisdom Publications, 2006 – Wallace is the neuro-scientist and Buddhist I mentioned briefly who is studying the effects of Buddhist meditation. Here is his web page, the page for his research institute and a description of the research project. He comes to Sydney once or twice a year to offer retreats. Fowler, W. J. “Stages of faith: the psychology of human development and the quest for meaning”, Harper, 1995 – I mentioned Fowler’s developmental model of spirituality in passing. This is the book where he lays out his research. There are summaries on Wikipedia and here. Bourgeault, C. “Centering Prayer and Inner Awakening”, Cowley, 2004 – The style of meditation in the Christian tradition that I’m most fond of is called Centering Prayer. This book is an excellent introduction to it. Finally, I promised a few people a reference to my own church and what we’re up to. The main church website for the Apostolic Johannite Church is here, our local parish in Sydney is here and you can sign up to the regular newsletter via the form on the front page. I’m running a Centering Prayer workshop later this month, so if you’re interested in exploring the Christian tradition in terms of what you can do, rather than what you need to believe, come along! I started an essay months ago on attending to the presence of the three persons of the Trinity, but I never got past the little prefatory note on Providence. It’s been lying around for ages, so I thought I’d just dust it off and post it. Perhaps someone might have time to give me some feedback on it. Just as a note, I’d like to say that as I wrote this, the aspect of providential immanence I was trying to reach toward had a very maternal feel to me. In an earlier version, I had this phrased as a maternal counterpoint to the paternal character usually ascribed to the First Person. I’m interested in how all that might shake out for other people. In this essay I want to suggest some ways to come into direct contact with the Divine Persons of the Trinity as they manifest in your own experience. I am not suggesting that it is possible to experience the kind of Divine Union described by the great saints and mystics of the church, but I am suggesting that, since we are assured by the doctrine of grace that God is constantly reaching out to us with lovingkindness, it is possible to begin a kind of intimate acquaintance with the Divine, simply by intending to and by inclining one’s attention in a correct “direction”. My claim is that the persons of the Trinity are evident to us in their energies (following Palamas and Eastern tradition) constantly, though we may be unable to either see them or to perceive their essence. By focussing a prayerful attention on aspects of our experience of the world moment-by-moment, I believe we are able to simply notice the Divine energies. I don’t mean by this either a physical energy like light, heat or sound or one of the more esoteric energies like “chi” or “prana”, but simply a natural and obvious sense of being-in-action. I hope this will become clearer as I explain the “how” in order to escape the perils of attempting to describe the “what” which has caused so many problems in the history of our tradition. To begin, as a preparation for attending to the Trinity, I want to direct your attention to as aspect of the Divine which is not named in the Trinity at all. We do not generally pray to this aspect of the Divine nature in the Christian tradition, which is generally seen as evidence that it is not present, but I prefer to see as evidence that it is simply radically unproblematic. From the beginning of our life in the world we are nourished and supported by the world in many ways. Initially, we begin as the union of two key cells, the sperm and the egg, implanted in the wall of our mother’s uterus, wrapped in the placenta. Blood flows to us, eventually after birth (all being well) we begin to breathe, we take food, we are embraced by gravity, supported by the earth. Invisible to us, we are enmeshed in an ecosystem which in turn is nourished by sunlight streaming to us from the blazing nuclear reactor several light-minutes away. We are supported both actively and passively by our family and community, embedded in systems of language and culture… and so on. It is not usual in the Christian tradition to acknowledge the immanent presence of the Divine appearing in the world as it is given to us. In fact, there is a robust thread in the tradition (in both Gnostic and Orthodox streams) of strongly suggesting that the world at best disguises the Divine so that it is unrecognisable or at worst the world is actively evil. This notion reaches its fullness in the dualistic theology of Mani via Augustine and in some expressions of Cathar thought. I would like to acknowledge that dualistic thread and simply step around it for the purposes of this essay. It has been written about and preached for more than two millenia and I feel it requires little more from me than a nod of recognition. There is a finer, subtler thread passing through St Francis and (in our own era) Matthew Fox that celebrates the immanent presence of the Divine and turns it into an active focus of worship. There are good arguments both theological and practical why this is a useful focus, but this is not exactly what I am saying either. What I would like to point to is that every human being, actively pursuing a spiritual life or not, active or contemplative, of any religion or of none, is embraced, enmeshed and embedded in physical manifestation. Apart from rare moments – a sunrise, happening upon surf crashing against cliffs, moments of systemic understanding, seeing the galaxy through a telescope – we do not notice this embrace. We live our lives focussing on other concerns, sometimes we engage with a spiritual life and usually turn our attention further from the world, but it remains – our uncomplaining support and nourishment. This support is the primal gift, the radically unproblematic, natural grace of our birth. I suggest that as a beginning to prayer, it is valuable to simply, briefly acknowledge the wonder of all this nourishment and support. As I encounter this purely immanent Presence, it seems somehow inauthentic to make it a focus of active worship, to sing songs to our embodiment or canticles to our systemic enmeshment feels odd to me. Instead, just allow your awareness to drift to your breath. Focus on the in-breath and follow the breath into your body, your seat, your feet, the way your shoulders sit, your head. The feeling of blood rushing around the body, muscles both tight and loose, belly feelings. After a while shift your focus to the out-breath and follow your breath out with your awareness notice the breeze, the sounds, the calls of birds or the sound of traffic. The wind in trees. The light through branches, the sun, lamps. Notice the ground as it supports your weight, the roof above you, the pull of gravity. Notice other people and their traces. Things around you made by the hands of others, food harvested by people, systems created by people – bills, posters, water supply, electricity. Keep extending your awareness to other aspects as you notice them either via your senses or as they arise in memory (as we imagine the past) or in fantasy (as we imagine the future). Once you have extended enough, just sit. Allow all that to pulse, beat, flow and thread around you. Gently, cultivate the emotion of gratitude: the same feeling when someone lets you go first in a queue, or when someone makes you dinner, or tells you that one fact that solves a problem. For all of this, this great womb of life in which I draw breath and find myself, Gratitude. Thanksgiving. Gratitude. Sit with that as long as you wish. I’m not telling you anything you haven’t already heard. I’m writing to you because I’m conscious of my own tendency to get a kind of fatigue about humanitarian disasters in other countries and because I want to shake myself, I’m also going to try to shake you. The news programs tell us of the scale of the earthquake in Haiti. They talk about how much suffering there is. One important part of that is how rickety civil society in Haiti was prior to the disaster. Haiti was the target of a lot of international relief in any case so they’re in an awful situation to cope with what’s just happened. The results of a desperately exploitative colonial past, economic boycotts and successive dictatorships have left the island barely able to sustain itself in the best of times. And now this. So there’s a desperate, practical, humanitarian need for immediate, large-scale help. The spiritual context for taking action is, to me, founded in the understanding that we are one human people, not separate. My devotion must be to my neighbour, as dear to me as my own soul. This isn’t a logical argument about why you should act, it is simply the spiritual fact of the matter – one we work hard to remain blind to because it is so terribly inconvenient, unwelcome and expensive. I believe that choosing to act on behalf of another, especially another I do not know and will never meet, is a way of asserting to myself, to my logical mind, this eternal truth of non-separateness. A decision to give in a situation like this, or even to give to someone on the street who asks, made consciously, resonates through my being beyond my rational capacities and tells all of Me the truth. I am not helping “them” I am helping “us“. So, with that as context, please consider doing something to help those who are already on the ground in Haiti. If you already support a charity which has a Haiti appeal, consider giving a little more. If you don’t here’s some suggestions. But don’t just send money, pray too. Pray for those of us in Haiti. Pray for those of us who have lost our parents. Pray for us who have lost our children, our sisters and brothers, husbands and wives. Pray for us in our need. Pray for our comfort and care and health and courage and will. May the Unknown Father rain down loving-kindness and strength upon the people of Haiti and may the souls of all the faithful departed forever rest in peace. For those interested in daily prayer and for whom the Divine Office is a bit too full on, here’s a little office that can be said once a day or morning and evening, as you wish. Stand or kneel. Say the Name slowly. In the name of the +Father and the Son and the Holy Spirit. Open my lips O Lord : and my mouth shall proclaim your praise. O God make speed to save me : O Lord make haste to help me. Chant the psalm for this office. If you don’t use a psalter, just start at Psalm 1 and read the next one at each subsequent prayertime. Just chant in a monotone, if you are worried about your singing, but chant. Do your best to keep your mind harnessed to the words of the chant, returning your attention to the chant when it drifts. Once you’ve chanted the psalm, you may move into Lectio Divina based on the text or simply move on to the reading. Using either the lectionary reading for the day or a reading you choose – perhaps by simply working your way through a Gospel or other book of your choice – read the text aloud. Optionally, move through the phases of Lectio Divina – lectio, ruminatio, oratio and contemplatio. reflect on the ways you have not lived up to your aspirations and pray for release from the debts you’ve incurred. If there are several prayer times in the day – consider focusing on a particular kind of prayer every day at that time. Slowly, treasuring the meaning of each phrase, with devotion. Lord, bless me and bring me to wholeness, compassion and understanding. This is the final Sunday before Ascension Sunday. This sequence of weeks between Easter and Ascension involve recognising the nature of what you might call our “fortunate condition”. I find it very easy to get wrapped up in how difficult ordinary life seems to be and sometimes the life of Spirit seems almost unattainable, spiritual practice seems all too hard, attending a service seems a chore. … is intended to bring mind and heart into a space in which are able to recognise the level of assistance which we are provided. Liberation is not only possible, it is feasible and we have help, but we need to accept it. You may find that contemplating and meditating on that sequence of five themes at any time in your life opens your heart into the possibility of freedom. What had seemed just too hard, can afterward seem effortless, pleasurable and essential. Try it!